Do you have a closet full of clothes with absolutely nothing to wear to holiday dinners and parties? The festive spirit always makes us feel like we want something new and exciting, that we can wear well into the new year. Here are some of Living The Second Act’s favorite affordable choices that look like million bucks (without spending a million bucks) for the upcoming weeks of celebrations. 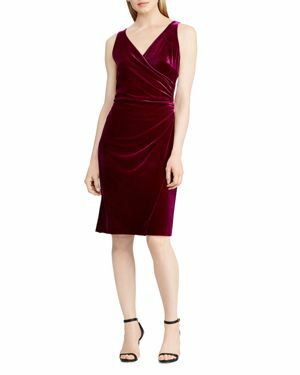 A velvet dress will surely set the holiday mood. We love how elegant this one is by Lauren Ralph Lauren without being too glitzy. Looking for something more conservative but with enough flair to make it special? 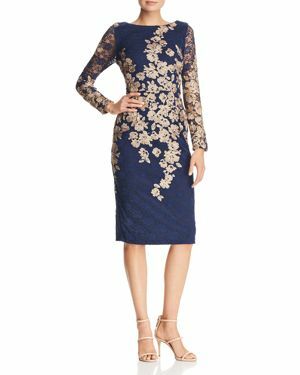 This Avery G navy and gold embroidered dress will help you stand out comfortably while still blending in. Not in a dress mode? Try pairing these faux leather NYDJ Leggings with a long sweater or a blazer and black t-shirt for a holiday house party. Real leather pants can stretch too much will cost up to $1,000. The best part of these? They won’t dig into your body after your have indulged in a few pieces of pie. 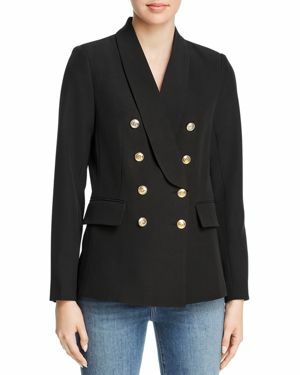 Speaking of blazers, this one from Aqua is a total winner for the holidays. The gold buttons make it sophisticated enough for skirt or fun enough for jeans. Pair with black pants and a white blouse to dazzle your friends and family this season. Already have that little black dress? 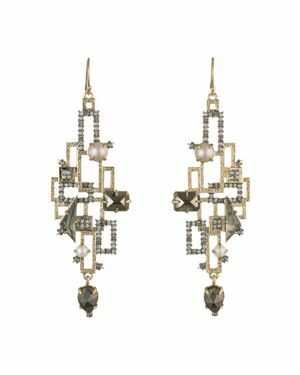 Invest in a funky pair of earrings to mix it up. We love these sparkly geometric gems from Alexis . You will feel like a rockstar all night long. 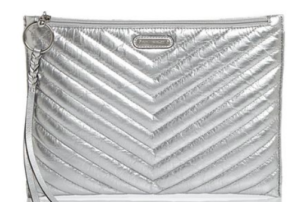 We love changing from our big day bags to small evening ones for a night out. 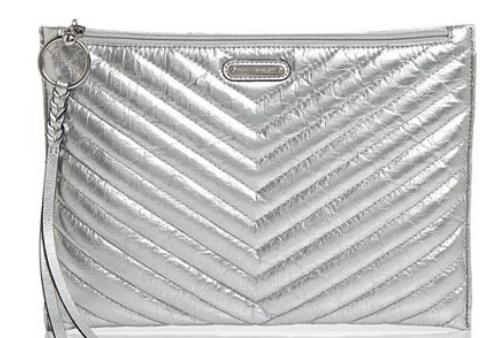 Anything silver is perfect for the holidays and for under $100, this metallic Rebecca Minkoff clutch is a great complement to any outfit or occasion. Sometimes we have to step it up a notch. 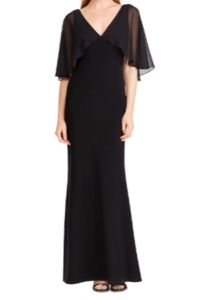 We love this Lauren by Ralph Lauren georgette overlay gown because of its ease (and price.) You will be ready for a winter wedding or New Year’s Eve ball in this comfortable and sophisticated piece. This may be the year that you say “I’m just buying a pair of holiday shoes” and that is just fine. You can find some great deals like these MICHAEL by Michael Kors gold sandals at Bloomingdale’s. The glitter is just enough to put you in a dancing mood.